I followed artist Jessie Brennan as she took a group of London Underground staff on a creative voyage for Art On The Underground. 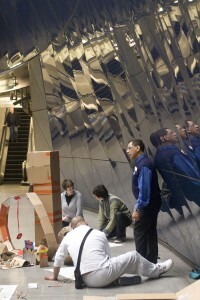 The Southwark Tube volunteers took brass rubbings from the Tate’s escalators through to constructing their own cardboard city in the underground foyer, all this while answering travel enquiries from bemused passing commuters. I wonder if Picasso could have been as prolific if he had been wearing a TFL uniform. 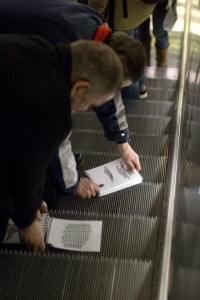 Art on the Underground is Benedict Johnson‘s client. We cover for each other’s clients when the other is busy (or break their arm while skateboarding).